What is the name for the window that holds the status icons? There's an easy way to verify. Go to mv's dlc/rpgmakerweb freebies/ plugins or how it is called/Yami folder. Inside that you'll find a Window identifier plugin. Copy it inside your project and follow its instructions. 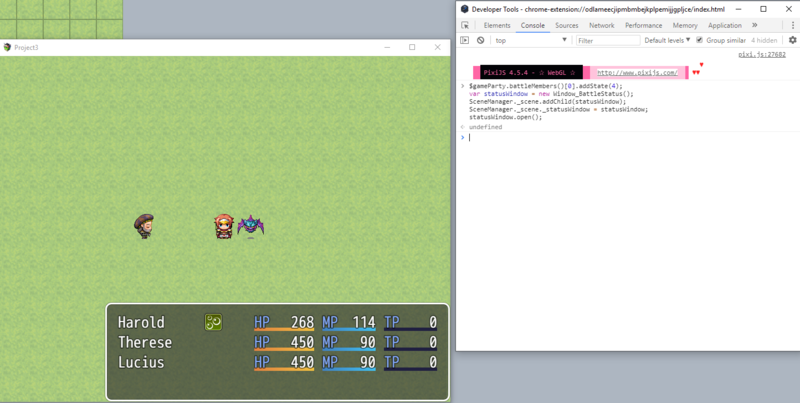 You'll see that it's an instance of Window_BattleStatus. alright, how would i go about creating and instance of the window in the map? i am able to pull up most windows (just tried window_options) and it worked, but when i try doing it with that window it doesn't show anything. That's because windows need to be initialized, resized and drawn and not every window does it for you. Check the game code. Welp, for that you'd need a custom window. Duly noted - and good to know. I'm still picking up what methods are already available. I looked for a "hasState" method on Game_BattlerBase, Game_Actor and Game_Enemy the other day, implemented my own, then later discovered what I wanted is "isStateAffected". 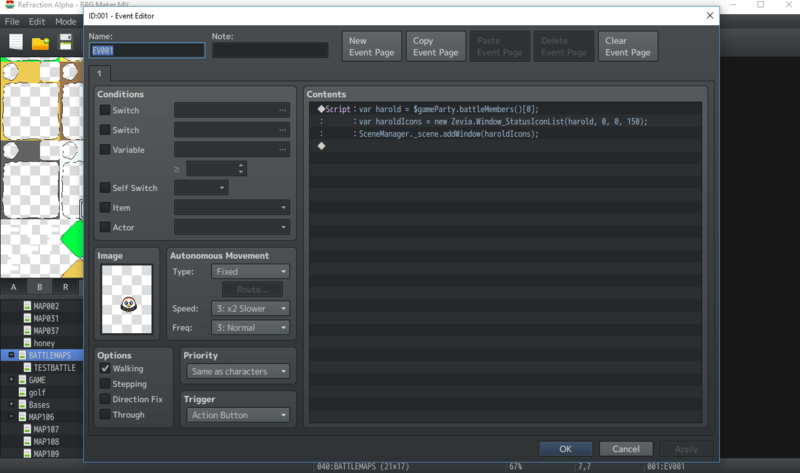 I guess you could also just do SceneManager._scene._windowLayer.addChild, but that's what addWindow does, anyhow. Do you literally just want the icons displayed in a column, or would you want the names next to them, too? Here's a plugin that provides you with a Window_StatusIconList. 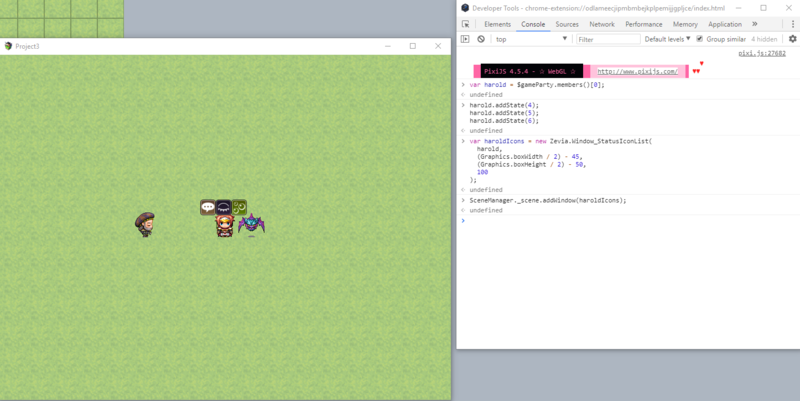 It'll work for both Enemies and Actors and is configurable in terms of icon sizes, number of rows of icons to display, window padding, and whether or not to show the base window skin. You'll still have to pass a battler in and specify the x and y coordinates as well as the window width. Make sure it's saved as "StateIconWindow.js". You can also download it from this post. 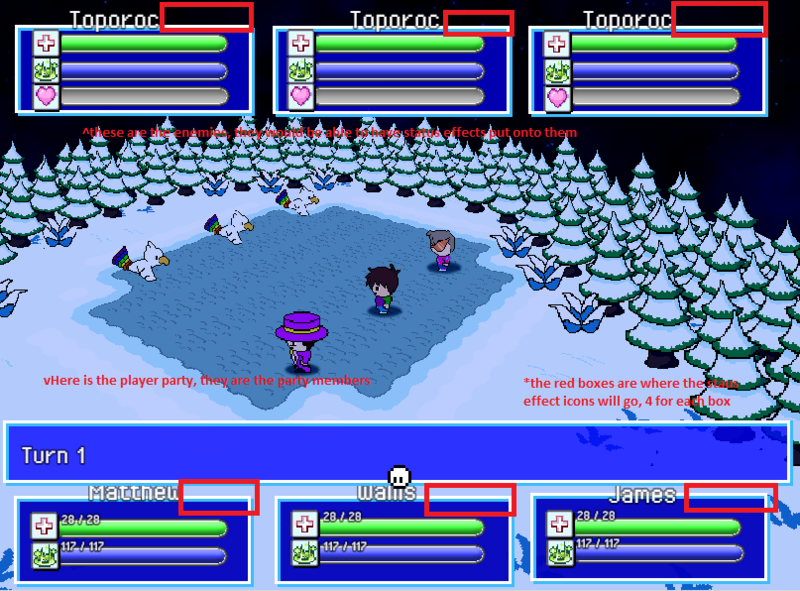 * contains state icons for a given battler (Actors or Enemies). * the width of the window. * number of rows has been filled. At that point, no more icons will be drawn. * To refresh the window, call the refresh() method. * @desc The width of the icons you want to display, in pixels. * @desc The height of the icons you want to display, in pixels. * @desc The number of rows of icons you want to display. i have an error, do you know what to do with it? "TypeError: undefined is not a function↵ at null.<anonymous> (file:///C:/Users/Poppie/Desktop/Project1/js/plugins/StateIconWindow.js:94:41)↵ at Array.reduce (native)↵ at Window_StatusIconList.setDisplayedIcons (file:///C:/Users/Poppie/Desktop/Project1/js/plugins/StateIconWindow.js:93:57)↵ at Window_StatusIconList.refresh (file:///C:/Users/Poppie/Desktop/Project1/js/plugins/StateIconWindow.js:135:14)↵ at Window_StatusIconList.initialize (file:///C:/Users/Poppie/Desktop/Project1/js/plugins/StateIconWindow.js:81:14)↵ at new module.Zevia.Window_StatusIconList (file:///C:/Users/Poppie/Desktop/Project1/js/plugins/StateIconWindow.js:69:25)↵ at Game_Interpreter.eval (eval at <anonymous> (file:///C:/Users/Poppie/Desktop/Project1/js/plugins/YEP_CoreEngine.js:1740:10), <anonymous>:2:19)↵ at Game_Interpreter.command355 (file:///C:/Users/Poppie/Desktop/Project1/js/plugins/YEP_CoreEngine.js:1740:5)↵ at Game_Interpreter.executeCommand (file:///C:/Users/Poppie/Desktop/Project1/js/rpg_objects.js:8930:34)↵ at Game_Interpreter.update (file:///C:/Users/Poppie/Desktop/Project1/js/rpg_objects.js:8838:19)↵ at Game_Map.updateInterpreter (file:///C:/Users/Poppie/Desktop/Project1/js/rpg_objects.js:6115:27)↵ at Game_Map.update (file:///C:/Users/Poppie/Desktop/Project1/js/rpg_objects.js:6022:14)"
@Poppie360 Can you show me the event/script call/code you're using to create the window? I just copied your event into my own project and it works fine, so I suspect it's a conflict with another plugin. Can you try creating a new project with no plugins in it, installing the plugin there, then copy-pasting that same script call into an event and running it there? If you get any errors, let me know - if they're the same as what you've already posted, you don't have to paste screenshots again. If you continue getting errors, can you try opening up the dev console with F8, running the following bit of code, then posting the results? I'm wondering if battleMembers() is returning an empty array or something.